Winchester National Cemetery in Virginia’s Shenandoah Valley is the final resting place for more than 5,500 veterans. Many of those buried at the cemetery were Union soldiers who died on one of the valley’s numerous battlefields. The cemetery features more than a dozen regimental monuments that Union states and veterans dedicated to honor their fallen citizens and comrades. The modified Meigs lodge served as both the cemetery office and housing for the cemetery superintendents and their families. Confederate leaders knew that control of the Shenandoah Valley would not only give them a western route from which to strike Pennsylvania, Maryland, and Washington, DC, but would also force the Union Army to divert troops away from their march toward Richmond. The first of six major battles in the Winchester area, the First Battle of Kernstown, occurred on March 23, 1862. Faulty intelligence led Confederate Major General Thomas “Stonewall” Jackson, and his force of 3,400, to advance towards the Union garrison at Winchester, where they believed they would be facing an opposing force of just 3,000. When Jackson arrived, he found Colonel Nathan Kimball leading 8,500 Union soldiers, who defeated the vastly outnumbered Confederates. The Union recognized, however, the continuing threat posed by the Confederates in the Shenandoah, and sent reinforcements to the area, leaving fewer available for the Peninsula Campaign in southeast Virginia. Two months later, Jackson and the Confederates would win a decisive victory at the First Battle of Winchester. On May 25, Jackson approached the city from the south, while his comrade, Lieutenant General Richard S. Ewell, moved in from the southeast. Although Union Major General Nathaniel P. Banks tried to rally his troops, they were overrun, and the Union regiments retreated to the north, crossing the Potomac River. The Second Battle of Winchester, between June 13 and 15, 1863, was another decisive victory for the Confederacy. General Ewell marched towards Winchester, capturing West Fort, one of the town’s garrisons, and scattering Union troops led by Brigadier General Robert Milroy. Confederate troops pursued Milroy, cutting off his retreat just three miles from the town, forcing the surrender of 2,400 Union soldiers. Thirteen months later, on July 24, 1864, the Second Battle of Kernstown saw Confederate Lieutenant General Jubal Early collapse the lines of Union General George Crook, preventing Crook from reinforcing General Ulysses S. Grant at Petersburg to the east. The deadliest battle in the area, the Third Battle of Winchester, also known as the Battle of Opequon, occurred on September 19, 1864, on the present site of the national cemetery. Union Major General Philip Sheridan beat back General Early’s men, forcing a Confederate retreat. Although the Union actually suffered more casualties, approximately 5,000 compared to 3,600 for the Confederates, the North’s overwhelming numbers, more than 39,200 troops versus just 15,200, won the day. The last major battle in the area, the Battle of Cedar Creek on October 19, 1864, appeared to be well in hand for the South after the successful surprise morning attack by General Early. However, when General Sheridan arrived at the battlefield that afternoon, he rallied his Union troops, sparking a powerful counterattack that effectively drove the Confederates from the Shenandoah Valley for the remainder of the war. The need for a centralized burial ground for the Union casualties from battles in and around Winchester, and surrounding towns such as New Market, Front Royal, Snicker’s Gap, Harpers Ferry, Martinsburg, and Romney, led to the establishment of Winchester National Cemetery in 1866. The first burials were battlefield reinterments. The rectangular cemetery is laid out with 91 square burial sections, numbered 1 to 92 (there is no Section 5). Originally, these sections were named after states forming the Union, and the burial of each state’s volunteer soldiers was made accordingly. 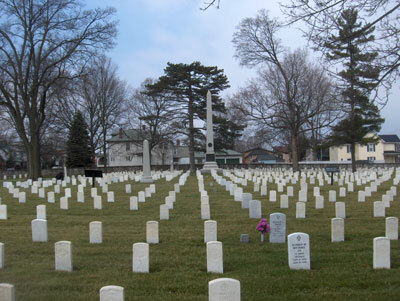 The largest group burial at the cemetery, located in Section 37, and marked by wooden posts at each corner, contains the remains of 2,338 unknown Union soldiers. The cemetery closed to new interments in July 1969. The main entrance to the cemetery is in the middle of the north side, and is marked by an elaborate iron gate that was erected in 1910, with smaller, pedestrian gates on either side. The cemetery’s central axis runs north and south, passing the superintendent’s lodge just inside the front gates. 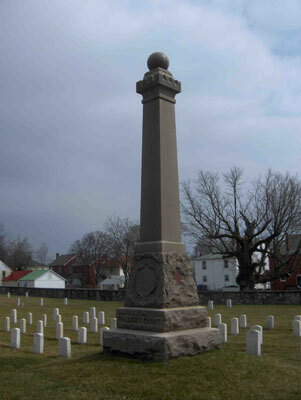 A flagpole sits at the center of the cemetery. A second entrance, located on the southern edge of the cemetery, directly opposite the main gates, features cast-iron gates anchored by stone piers. A low limestone wall encloses the cemetery. The superintendent’s lodge, built in 1871, is based on the design by U.S. Quartermaster General Montgomery C. Meigs found at many other Civil War-era national cemeteries across the country. However, rather than having a mansard roof hiding a second story, the one-story lodge was capped by a hipped roof. A frame kitchen addition dates from the turn of the 20th century, and a second story was added in 1914. The kitchen was improved at an unknown date, with a laundry room added off the kitchen in 1936 and basement dug under the lodge. The cemetery features 15 monuments, most dedicated to fallen Civil War soldiers by their surviving comrades. These include memorials to the 114th New York Volunteer Infantry, the 123rd Ohio Volunteer Infantry, the 12th Connecticut Volunteers, the 13th Connecticut Volunteers, the 14th New Hampshire Regiment, the 18th Connecticut Volunteers, the 34th Massachusetts Infantry, the 38th Massachusetts Volunteers, the 3rd Massachusetts Cavalry, the 8th Vermont Infantry, the 8th Vermont Volunteers, and the 6th Army Corps. The Commonwealth of Pennsylvania dedicated a monument to its Civil War dead in 1890, which featured a bronze figure of a woman supporting a fallen soldier. Likewise, in 1907, the Commonwealth of Massachusetts erected a life-sized bronze sculpture of a soldier to honor its Union casualties. A plaque memorializing the Third Battle of Winchester is located near the main entrance, and two seacoast cannons, planted in concrete bases, are located on either side of the flagpole. Winchester National Cemetery is located at 401 National Ave., in Winchester, VA. The cemetery is open for visitation daily from dawn to dusk. No cemetery staff is present onsite. The administrative office is located at the Culpeper National Cemetery, and the office is open Monday to Friday from 8:00am to 4:30pm, and is closed on all Federal holidays except for Memorial Day and Veterans Day. For more information, please contact the cemetery office at 540-825-0027, or see the Department of Veterans Affairs website. While visiting, please be mindful that our national cemeteries are hallowed ground. Be respectful to all of our nation’s fallen soldiers and their families. Additional cemetery policies may be posted onsite. Winchester National Cemetery was photographed to the standards established by the National Park Service’s Historic American Landscapes Survey.